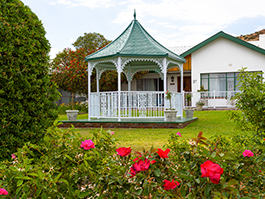 Your hosts, Alex and Rene Dumas, will offer you a warm welcome at Colesview Guest House, where the comfort and satisfaction of their guests is their top priority. 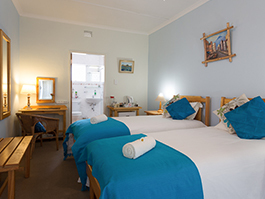 The guest house is situated in the town of Colesberg, an oasis in the Karoo, halfway to everywhere. 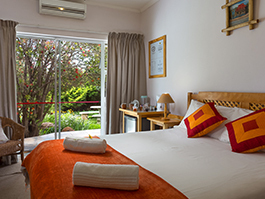 Conveniently located in the upper part of town, we are just one kilometre off the N1 highway in a quiet, secluded, residential area, conducive to a good night's rest. 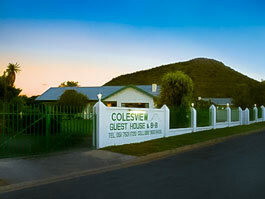 Recently refurbished, this elegant guesthouse offers a stunning view of Coleskop Mountain, visible from 40 km away. When the sun slips below the horizon, brushing the sky with brilliant hues, Coleskop's former name, Towerberg (meaning Magic Mountain) seems more appropriate. Our "rooms with a view" can accommodate 25 people in 8 stylishly decorated bedrooms. The rooms all have separate entrances and sleep from 2 to 6 people, all with bathroom en-suite (either with bath, shower or both). 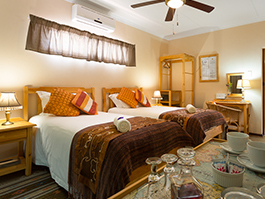 The rooms are all equipped with double or twin beds, boasting comfortable mattresses, crisp linen, ceiling fans, air-conditioners, heaters, DSTV, electric blankets in winter, fridges, wall-safes and tea and coffee-making facilities. Cots, hairdryers and extra mattresses are all available on request. 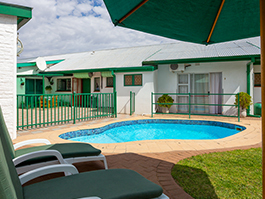 There is a TV lounge to relax in after a hard day's travelling, as well as a sparkling pool to cool off in and a barbeque area where you can braai, lounge in the sun and get into the holiday spirit! We have secure, undercover, lock-up parking available as well as sufficient fridge and freezer space for your perishable items. We offer an "English-style" breakfast in the morning, comprising a selection of cereals, fruit juice, bacon, sausage, eggs, tomato, yoghurt, toast and spreads and that essential bottomless cup of tea and coffee to kickstart you on your way. Breakfast is available from 6:30a.m. if you need to make an early start. 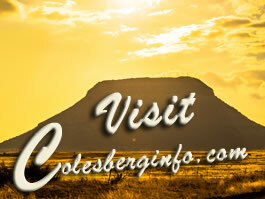 Colesberg offers a selection of restaurants, all close to Colesview, if you fancy a night out on the town! We have all the menus in the guest house and we will point you in the right direction. 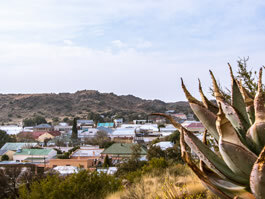 Colesberg has retained much of the charm of an early Karoo town and for such a small place has a remarkable number of national monuments. It was also the scene of considerable fighting during the Anglo-Boer War. For those interested and with a little time to spare, we can organise guided tours of the Colesberg/Kemper Museum, of the town or of the Anglo-Boer sites. Room 1: This room has two single beds and en-suite bathroom with bath and shower above the bath. 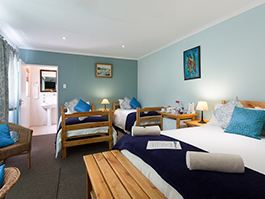 Room 2: This room has a double bed and a single bed and en-suite bathroom with shower. 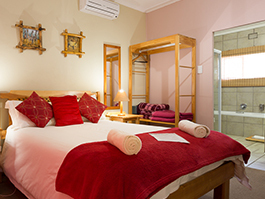 Room 3: This room has a double bed and en-suite bathroom with shower. 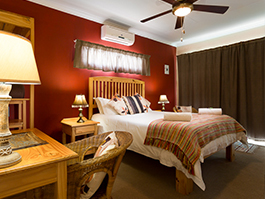 Room 4: This room has a double bed and en-suite bathroom with bath and shower. Room 5: This is a very big room with a queen-sized bed and four single beds and en-suite bathroom with bath and shower. 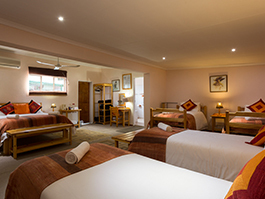 Room 6: This room has a double bed and two single beds and en-suite bathroom with shower. Room 7: This room has a queen-sized bed with en-suite bathroom with shower. 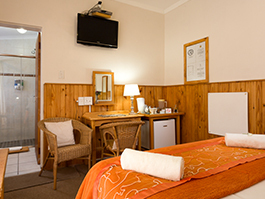 Room 8: This room has two single beds and en-suite bathroom with shower. We have a sparkling pool to refresh you after your long, dusty journey. Around the pool is a barbeque area with barbeque facilities. We also offer freezer facilities. Enjoy our scrumptious English breakfast in our dining room, comprising cereal, yoghurt, juice, egg, bacon, sausage, tomato, toast with a selection of spreads and bottomless cups of tea and coffee. Packed breakfasts are available on request for those leaving early. We have secure, undercover, lockable parking for vehicles. We are in a quiet residential area, however we are still close to restaurants, shops, garages etc. There is a guest TV lounge, with television, for exclusive use of our guests. Soft drinks are availble for sale in the guest lounge. Browse in our art gallery for locally painted Karoo scenes. 37 Torenberg Street Colesberg 9795, SA. as to how we can improve your experience feel free to contact us. contact us if you want to be listed.